Email is the first and foremost communication for Octavia Goredema, a Los Angeles-based editor and social entrepreneur. Octavia oversees two media platforms — Twenty Ten Talent helps black female professionals accelerate their careers and Twenty Ten Club shares the success stories of black female entrepreneurs. She is also a board trustee of The Zimbabwe Educational Trust and a Fellow of the Royal Society of Arts. Unfortunately, this means her inbox was becoming inundated on a daily basis with emails from different time zones. Over time, Octavia began to realize she needed a more effective strategy for managing the volume of emails she was receiving. Octavia came across SaneBox while looking for a solution to her email nightmare. Initially, she thought she needed to find a faster way to read and respond to emails. What she didn’t realize was there a tool ready and waiting to take charge of her inbox. SaneBox filters the scores of newsletters Octavia receives into their own folder, where they are automatically marked as read. Now, Octavia is able to get to work faster, as her emails are already prioritized each and every time she logs on. “Before, I was so distracted by the sheer volume of emails that I was missing the ones that mattered the most,” she adds. Thanks to the SaneLater filter, Octavia knows the emails that don’t need first and foremost attention are neatly filed away for future reference. In addition, Octavia has the option to place an email in a Snooze folder and it will be placed back in her inbox when it’s more convenient. Even better, if she chooses to, she can now drag an email into the SaneBlackHole folder and never hear from that sender again. Like this post? It would mean a lot if you’d share it! Remember when email used to make your life easier, not harder? 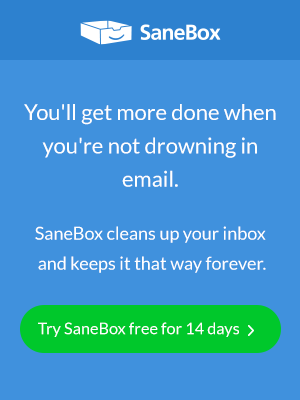 SaneBox gets you back to that state so you can focus on the things that actually matter. Take charge of your productivity today by signing up for a 14-day free trial. Next Entry Is ‘phubbing’ killing your career and relationships?